Produce Music is a comprehensive electronic music production course developed by ARIA Award-winning artists, Ableton Certified Trainers and producers of iTunes #1 albums and Beatport chart-topping tracks. 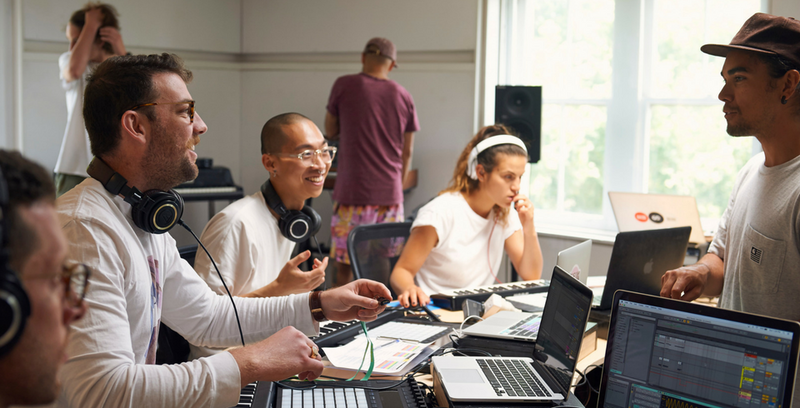 Students leave with a thorough mastery of the Ableton Live software, a complete music production focused skill set, a portfolio of completed projects and everything they need to effectively produce release-ready music for themselves and others. By the end of this program you will have a creative portfolio and electronic press kit including completed original tracks, remixes and edits, soundtrack and video work , promo mixes, and more. Produce Music is structured so that your study time is one month of face-to-face part time training followed by one month of creative break. This cycle repeats as students progress through each module across 46 weeks, giving you the perfect amount of time for knowledge and skills to settle after each module. Printed notes and Ableton exercises handed out every session and perfectly crafted online videos, delivered at the right time will help fast-track your progress. Instalment plans are available and we can get you started with a simple deposit followed by affordable monthly payments. More information on our Instalment Plans can be viewed on each intake’s booking page.